Naoe Suzuki's psychologically complex works on paper reference imagery from circus animals and water to medical abnormalities and scientific technology. These highly detailed and meticulously executed works are created in mineral pigment and graphite, and the effects are a feast for the senses. 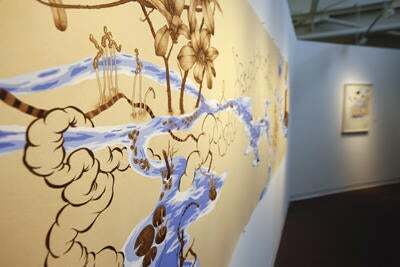 Suzuki's series Blue was created while she was at a residency at Blue Mountain Center in the Adirondacks, where she was able to swim in a lake every day. There, she experienced the cleansing and renewing power of water, and she also began thinking a lot about the terrible condition of water throughout the world. In her paintings, the water is contaminated with debris, organs, cells, bottles, antiquated machinery, and more, all in exquisite hand-drawn detail. Another recent series, Intueri, the Latin word for "to look inside," is the result of an intuitive process of drawing that begins with one or two small images of intestines or organs drawn with a fine-point pen. The images grow from there into microcosmic worlds that are dense with intestines, organs, and plant forms, inviting the viewer to "look inside" this complex world.